Front cover of the announcement for a Six O'Clock Club Dinner on the topic, "Madison's Business Interests," with an embossed scrolling silver frame adorned with sprays of blue flowers with silver stems. Text printed in dark blue ink on blue card stock. The Six O'Clock Club was a men's social and dining club, centered on topics of political and civic interest. The separate menu for this evening included blue points, green turtle soup, and roast chicken. 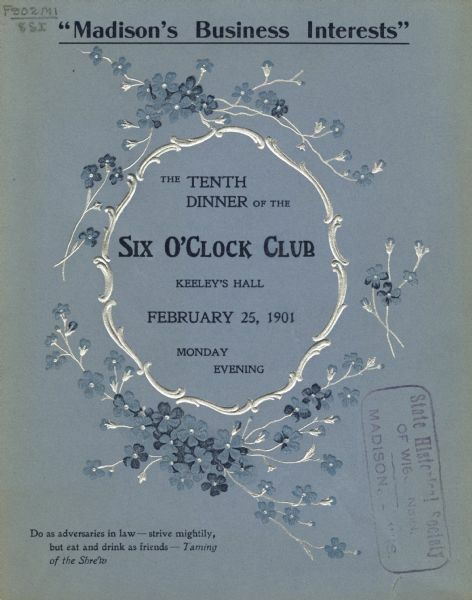 For other Six O'Clock Club Dinner menus, see also Image IDs: 102830, 103636, 103640, 103723, 103782, 103797, 103798, 103802, and 103805.